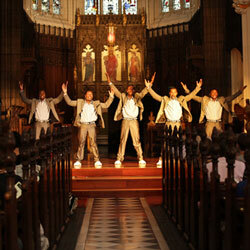 Far from the snoozy pews of sermonic preachings, these 5 snappily dressed young South-African singers filled the cavernous rooves of St John’s church with such a wonderful feel for singing that it felt as if they had summoned the spirit of all Africa & flung into Scotland’s capital. Plucked form obscurity busking the streets of Johannesburgh, they are now touring Britain delivering a well-thought out & eclectic 20-song selection of South- African songsmithery. The band consist of five singers who perform their musical a capella, & sang to a global audience at the opening ceremony of teh World Cup. Reaching such heady heights was not a coincidence, & their performance is quite simply excellent. Add this to the magnification of their music in the acosutics of a Christian Church, I defy anyone to not be moved by the occasion. FIVE STARS.